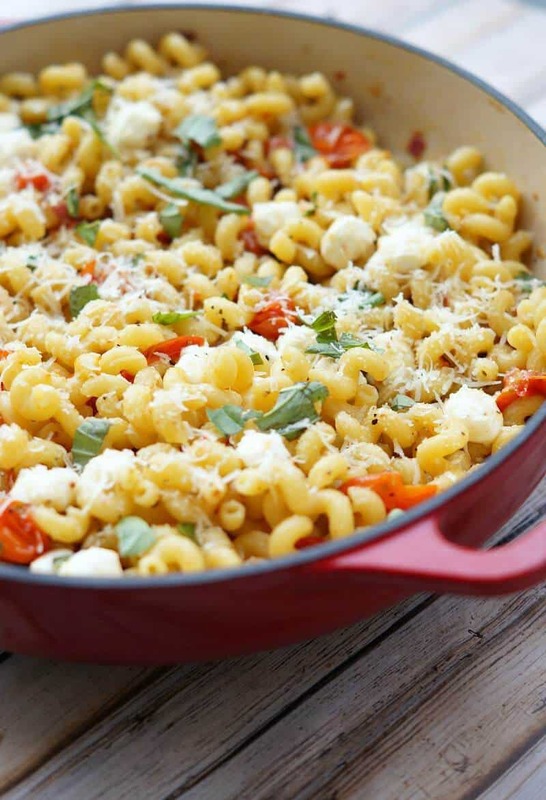 It is the perfect time of the year for this Roasted Tomato Caprese Pasta! 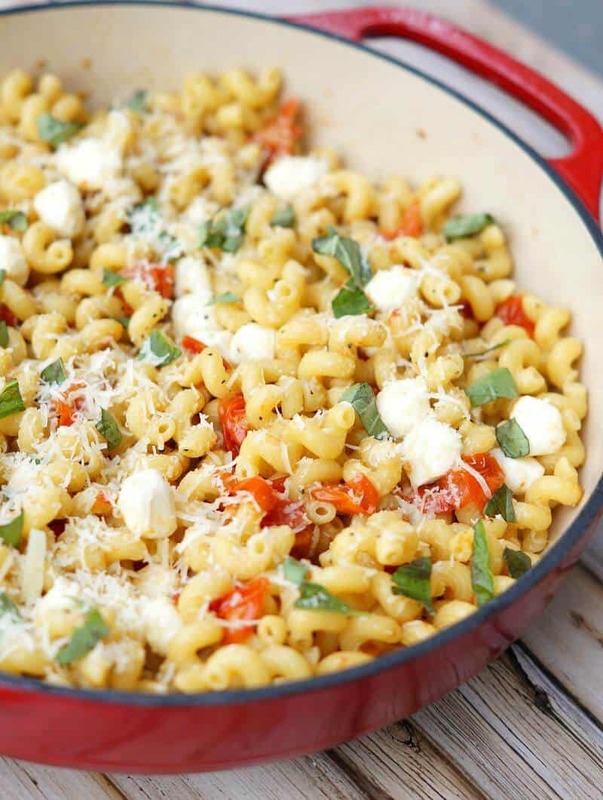 Pasta coated in a buttery, garlic sauce and tossed with tomatoes, fresh basil, and balls of mozzarella! 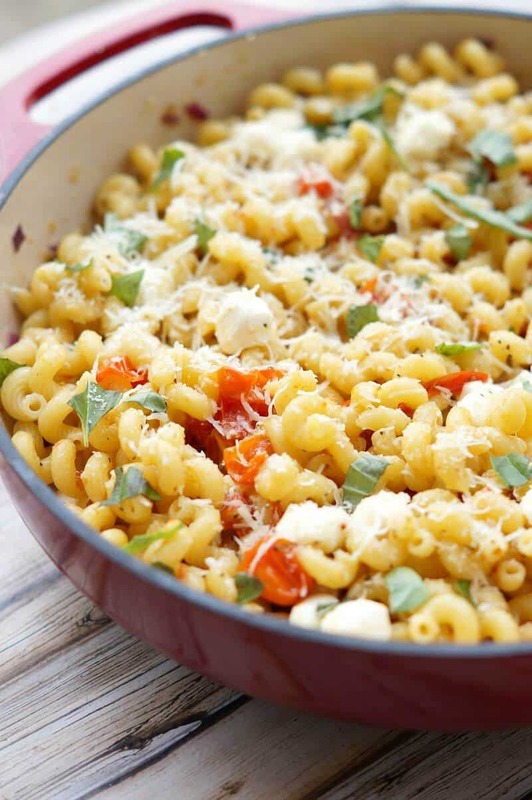 It is no secret that we love pasta around here. I have always been a big pasta eater, especially when I was growing up. When I first started cooking for my husband (then boyfriend) he would look at me strangely when I didn’t just serve pasta topped with meat and red sauce. While I love spaghetti and meatballs, I love to mix up pasta night. I worked in a small Italian restaurant when I was in high school, and bucatini caprese was one of my favorite dishes on the menu. Thick straw like stands of spaghetti, tossed with lots of tomatoes and fresh mozzarella, served with lots of basil…delicious. I didn’t have any bucatini this time, but this meal turned out equally delicious with the cavatappi pasta. The sauce on this is just amazing. It is so simple and requires such few ingredients, but the taste is incredible. I switched up my classic version of this recipe by roasting the tomatoes. Oven roasting veggies is my favorite trick for making out of season vegetables taste delicious. In the heart of summer, roasting the tomatoes isn’t necessary, but in the spring, roasting brings out the sweetness and richness of the tomatoes. You can do this with all veggies! I guarantee you can convert non-veggie lovers by pan roasting some with some salt, pepper, and olive oil! I converted my husband to loving cauliflower using this method! This dinner comes together so quickly and easily. It takes less than 30 minutes, which makes it a great weeknight dinner. You can serve this all on its own for a meatless meal, but I love to grill some chicken to serve alongside it! I have an optional note where you can add extra virgin olive oil after cooking. You make the sauce from the milder olive oil, but we love the taste of extra virgin, so I add some of that as a finishing oil. You also want to add the cheese at the very end so it doesn’t melt too much. I love biting into the big chunks of cheese! 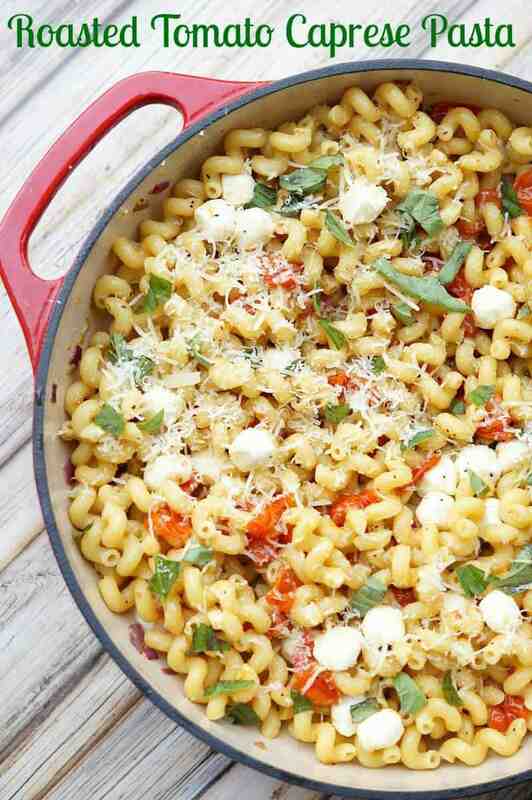 I hope you try this Roasted Tomato Caprese Pasta soon! 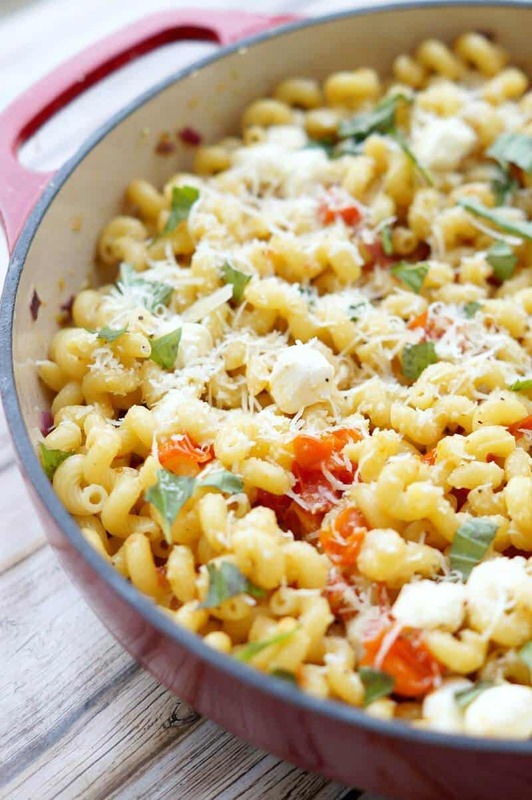 It is seriously easy and delicious and who doesn’t like cheesy noodles, right? I`m LOVING this post Debi! 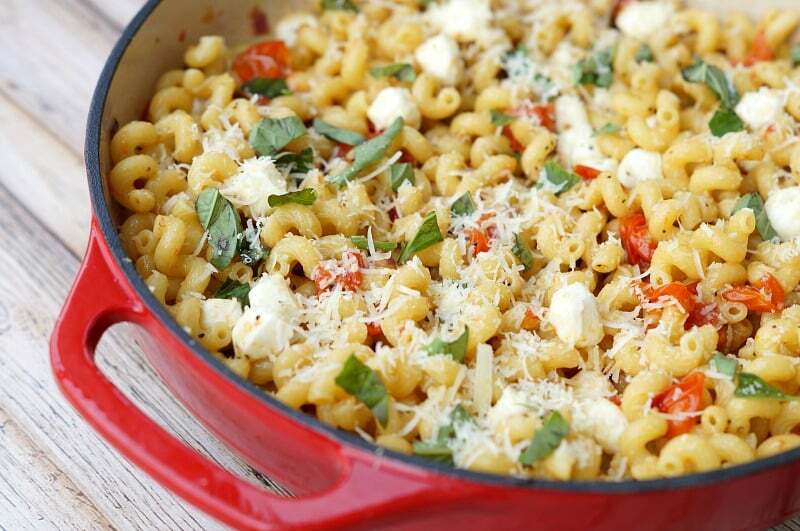 You`re so right, this is the perfect summer pasta! Can`t wait to give it a try! I am always craving pasta 🙂 Thank you! this looks so yummy for summer. I love that it is not a heavy sauce and my kids will eat it up. It is so light and fresh, and my daughter loves it too! Love the fresh tomatoes! What a perfect combination of flavors. And a good fresh mozzarella makes all the difference, doesn’t it? Yes, it definitely does! I can always tell when I buy the good stuff…it is so much better! This side dish is the perfect accompaniment for anything off the grill. I love how easy it is to throw together and how it has everything needed in one bowl. Full of flavor and I imagine delicious. Yes! It is perfect to go with grilled meats! It is so easy and delicious!